Board the ‘Milford Mariner’ for a Milford Sound overnight cruise along this pristine waterway, situated in New Zealand’s impressive Fiordland National Park. 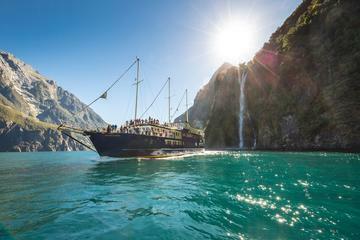 Cruise the entire length of the fiord all the way to the Tasman Sea before your captain anchors in Harrison Cove. Then spend the night in a private single or twin-share en suite cabin, including a 3-course buffet dinner and breakfast. Listen to a nature guide on board and make use of provided kayaks to explore waterfalls and glacial-carved cliffs like Mitre Peak. Explore the spectacular fiords of New Zealand on an overnight cruise — a leisurely way to see Milford Sound. Make your way to the Milford Sound Wharf to board the Milford Mariner, a purpose-built vessel designed to accommodate passengers in private single or twin-share cabins with en suite bathrooms, catering to those who enjoy a combination of comfort and adventure. Take a seat in the observation lounge or large open deck to view the stunning landscape of the South Island’s Fiordland National Park from the water. While the cruise boat departs for the Tasman Sea, you’ll glide past cascading waterfalls, lush rainforests and cliffs carved by ice-age glaciers. The knowledgeable nature guide on board points out natural landmarks, such as the oft-photographed Mitre Peak, and discusses the area’s wildlife. Keep an eye out for sunbathing fur seals, as well as penguins, dolphins and even the occasional whale. If you’d like, relax with a drink in hand, sold at the licensed, onboard bar. After reaching the open sea, your captain hoists the sails for a period (subject to favorable weather conditions) before returning the Milford Mariner to Harrison Cove to anchor overnight. In the sheltered cove, enjoy activities including sea kayaking and exploring the shoreline on the tender craft, or simply relax on deck. Your overnight cruise includes a delicious three-course buffet dinner, served in the spacious dining saloon, before you retire to your private cabin for the night. The next morning, enjoy a hearty cooked breakfast and further cruising before you’re returned to the Milford Sound Wharf. 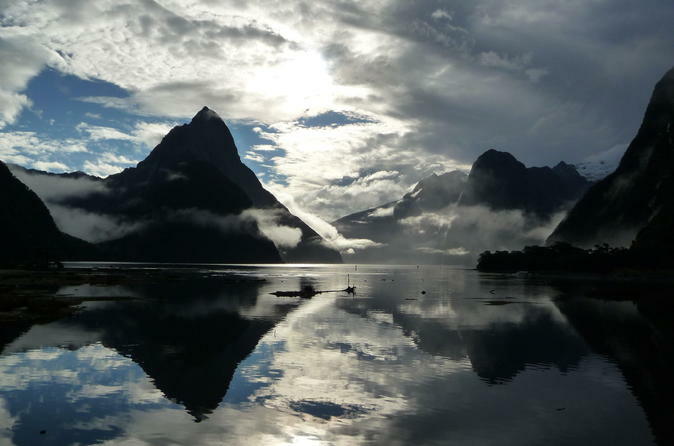 Fabulos way to experience the Milford Sound! Good accommodations and food but the best is spending the night on the water and waking up to the beautiful scenery! Staff - very friendly and accommodating - made you feel at home as soon as we boarded! Definitely a must do for first timers. Enjoyed every moment! The staff were professional and friendly, the food was excellent. We were fortunate to have perfect weather. I was worried about leaving our car with all of the luggage in it...no problem. I was concerned about cabin space. We had a private bathroom...no problem (slept)! Wonderful experience! We got to see the whole sound and got lots of info on the nature and history. Excellent Trip. Tour of the fford in both the evening and morning inc commentary, kayaking, nature cruises, great food, slideshow, very friendly and knowledgeable staff. Highly recommended. Undoubtedly the best way to see Milford Sounds, particularly if you have limited time. The cruise departed at 4:30pm, just when the last of the day tours where finishing, leaving us the entire of the sounds with just one other overnight vessel. We saw sunset and sunrise on the sound, were well-fed and looked after by the Captain and his team and were well-informed by the on-board tour guide. After kayaking, seal-spotting and having some great weather, the trip was well worth the journey and expense. It's pretty good, the cabin is clean and the food onboard is really great. However cruise itself is very short : it's like 1.5h in the evening and similiar in the morning and you basically go the same route which is a little disappointing. We did the overnight Milford Sound tour which was truly amazing. In the evening we had 5 inches of rain which really enhanced the scenes before us, the number of waterfalls that were flowing grew expodentially and taking the trip out on the boats tender was an added bonus. In the morning clear bright blue skies but the number of waterfalls was reduced by two thirds but still very spectacular. The on board nature guide showed us rare penguins, seals, birds etc and the Captain took the boat up close to see them in their natural habitats. We would highly recommend this tour in the South Island. A very good trip which was throughly enjoyed!